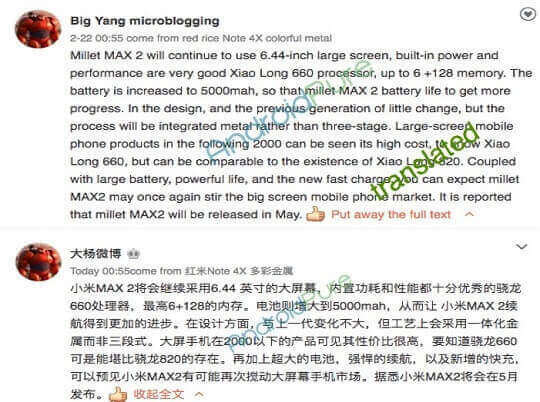 Nothing has been officially confirmed yet, but the alleged specifications of Xiomi's upcoming Mi Max 2 smartphone have been revealed through a Weibo post, and it says the device will be released in May. According to the Weibo post, the Mi Max 2 will use the same 6.44-inch edge-to-edge display that is used on last year's Mi Max. It will be powered, however, by a more powerful Qualcomm Snapdragon 660 chipset with a whopping 6GB of RAM and 128GB of internal storage. Based on the post, we're guessing the second generation of the Mi Max will have more than one variant. The Mi Max 2 will also come with a bigger 5000mAh battery with fast charger support. The current Mi Max, which was released in May 2016, is equipped with a 4850mAh battery. There are no details revealed yet for the smartphone's camera specs and operating system, but we believe it will run on the latest Android 7.0 Nougat OS. If the rumor is true, we'll soon be seeing the new Xiaomi Mi Max 2 in May.